The end of the year never ceases to amaze me. It goes by in a frenzy of food, family, booze, parties, really happy holiday music, and feasts. I can barely remember which way is up through the haze of sparkle and lights, but oddly I would not have it any other way. This Thanksgiving we hosted a “night before the bird” party. Let me tell you, trying to run in a Turkey Trot 5k after a heavy handful of drinks and only two hours of sleep is near impossible. But I digress. It was fun nonetheless. This year we played the role of happy guests for the big turkey feast, and we were each tasked with bringing one item to the party (a brilliant hosting tip I must steal). I chose the appetizer and decided to make something light, easy, and totally fancy pants. This appetizer covered all of the bases. It forced everyone to eat at least one vegetable and was pretty as a picture. This recipe is just as delicious without the smidge of goat cheese I tucked in for my family. Try using a vegan cream cheese or just completely go without. 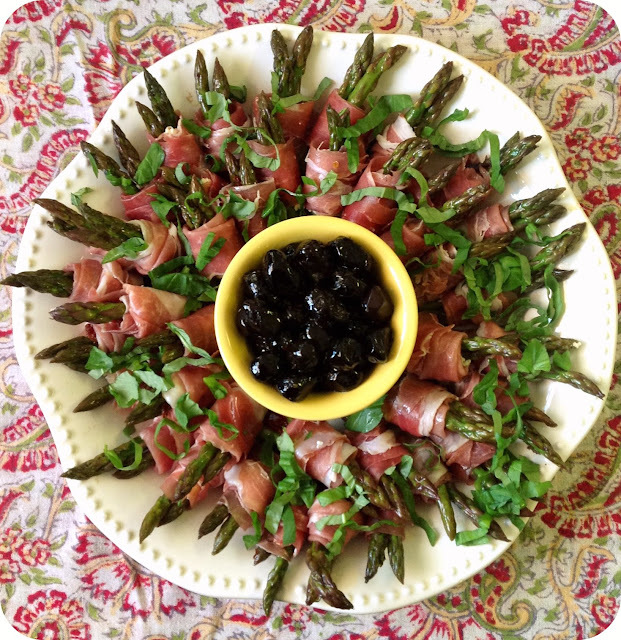 The delicate flavor of the gently marinated balsamic asparagus along with the salty bite of prosciutto and pungent zing of sun dried tomato are really what makes this sing! Serve these bundles with fancy olives or use them as part of an assorted antipasti platter. They are simply delish! Bring a large pot of salted water to a boil. Throw in asparagus tips and blanch until bright green; about 2 minutes. Drain and immediately immerse the asparagus in ice water to stop the cooking process. In a large bowl, vigorously whisk together the marinade ingredients. Transfer the drained and dried asparagus in to the bowl with the marinade and toss. Cover and refrigerate for at least one hour. Create an assembly line of ingredients: prosciutto, marinated asparagus, sun dried tomato, and goat cheese (if using). Place two spears of asparagus in the middle of a slice of prosciutto. Smear a small amount of goat cheese and place one small slice of sundried tomato in the center. Wrap gently but tightly in bundles (as shown in the picture above). Repeat until all of the asparagus are bundled up. Arrange on your favorite platter and sprinkle with a chiffonade of fresh basil leaves. Cover and refrigerate until you are ready to serve. Can be served cold or at room temperature. Will you make these for me and Daddy? Pretty please! But of course mommy dearest. I like all the ingredients that go into the wraps. It's a great combination! Thanks for sharing. What a beautiful presentation!!! This is perfect and easy app for the holidays! It's so easy and so tasty! wow! these look incredible! a must have at this time of year! Looks like a royal dish to me, amazing presentation! Absolutely wonderful recipe! Great wraps! And the photo is gorgeous! Oh wow! I think I would sneak off into a quiet corner with this plate and a glass of champagne and celebrate my utter greed! How gorgeous! Yum, this is perfect cocktail party food. Which happens to be my favorite kind of food. I love how you wrapped asparagus with prosciutto and arrange them on the plate. Very pretty and perfect appetizer dish!